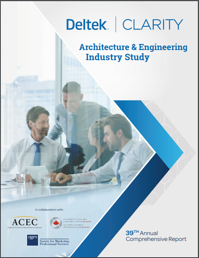 Each year Deltek conducts a survey of ﬁrms in the architecture and engineering industry to identify key issues impacting the market, highlight bright spots, and forecast future trends. Guided by industry experts, the survey focuses on financial statements, business development, project management, human capital management, and technology trends. This year, in total, 952 individuals took the survey, and nearly 450 companies provided input. Firms in this study are of varying sizes and headquartered across the US and Canada. Firms’ ﬁnancial statements reveal year-over-year stability in the industry, with most impacts appearing to be driven by talent management and stafﬁng changes. Average operating proﬁt on net revenue was 13.2%, up just slightly from last year’s 13% and the previous year’s 12.8%. Utilization rates dropped slightly to 59.4% from 60.0% last year. The net labor multiplier saw a decrease to an average of 2.96, down quite signiﬁcantly from a spike of 3.02 last year and back in line with 2015. Firms reversed a ﬁve-year decline in overhead rate, increasing from 154% to 155%. The average collection period dropped by one day to 71 days, although high performers increased by two days to a 67-day average. Firms are looking to diversify opportunities and their business development efforts to stay ahead in a competitive market. Net revenue growth forecast was 5.2%, down just slightly from last year’s 5.3%. Firms are using a diverse array of staff for business development, with 19% of ﬁrms using dedicated business development staff only, 31% sellers/doers only, and 50% using a mixture of both. However, only 46% of ﬁrms had a formal business development process for their staff. Win rates improved to 50.0%, rising 9.8 percentage points from last year’s 40.2%. The percentage of ﬁrms with a formal go/no-go process decreased from 75% last year to 67% this year. More ﬁrms expect growth in surveying/geographic information systems (GIS), transportation, and commercial markets than any other industry, whereas nearly 60% of ﬁrms expect their position to stay the same or decline in the residential, education, and hospitality markets. Firms need to continue to focus on improving the project management discipline and increasing client satisfaction. Two-thirds of all ﬁrms have a high level of visibility on cost variance, whereas more than half of all ﬁrms stated that they had low or moderate visibility into schedule variance and client satisfaction. Compared to last year, client satisfaction visibility decreased from 53% to 45%. Firms this year reported that 20% of their projects were over budget and 25% of their projects were behind schedule. Sixty-one percent of ﬁrms had high conﬁdence in their overall project reporting abilities, down from 72% last year. More than 90% of ﬁrms felt conﬁdent they were accurately reporting the actual cost and budget of their projects, whereas only 69% of ﬁrms felt the same about the accuracy of their schedule reporting. In terms of discipline maturity, only 47% of ﬁrms used a formal project management process for three-fourths or more of their projects. Overall, 18% of ﬁrms had a PMO or center of excellence. Additionally, only 39% of ﬁrms have less than one-quarter of staff with formal project management training. Eighty-one percent of ﬁrms are measuring client satisfaction, and of these ﬁrms, 45% are conducting these measures for all projects and 49% for strategic projects only. The majority are measuring client satisfaction irregularly, compared to 22% of ﬁrms that do so at key project milestones. Firms are experiencing growth, but employee turnover—particularly voluntary turnover—has increased, making staff retention and improved talent acquisition imperative. Staff growth is 4.3%, declining from 6.9% last year. Employee turnover increased to 12.8%, up from 11% last year. 34% of ﬁrms had more open positions, compared with only 15% with fewer open positions. The average time to ﬁll positions was 31–60 days, although for 15% of ﬁrms, it takes an average of 90 or more days to ﬁll positions. Compared to last year, there was a 7-percentage-point decrease in ﬁrms that ﬁlled positions in less than 30 days. Of all ﬁrms, 43% have a formal succession plan. For 68% of ﬁrms, their succession plan applies only to current leaders and next-in-line leaders, whereas for 7% it applies to all employees. In the ﬁrst year tracking technology trends, ﬁrms are looking for better ways to collect data that can be leveraged for strategic decisions. Geolocation and the Internet of Things (IoT) were the most important technology trends. Most ﬁrms did not rank artiﬁcial intelligence (AI) or wearable technology as technology trends they are focused on, but it can signiﬁcantly change the way we run our businesses when the time is right. While these are the highlights of the 39th Annual Deltek A/E Clarity study, the report goes into much more detail. Using these results, you can see how your firm has been doing not only compared to your previous year, but also to other comparable firms in your industry. With these industry insights, you can develop future goals to help your firm stand out against the growing wave of competition. For an in-depth view of everything included in the 39th Annual Deltek A/E Clarity report, download your copy today.